Please note Post script at end about a brewery I forgot! Naughty Sophie. We’ve had IPA day and GBBF gave cask ale all the headlines so I thought I’d write something about lager to give us all a change. The UK’s ale brewers seem to have finally cottoned on to how to attract lager drinkers. Answer: brew lager. Bigger-flavoured and fruitier than their mass-market counterparts these brews represent a chance to elevate lager from its negative fizzy-piss-swilled-by-wife-beaters loutish image and define it as a quality British product we can be proud of. Here’s a few ideas for what pubs could stock to knock the big brands of their best-selling perches, or for you to seek out because you you want to come out of the lager-loving closet with your head held high. Williams Bros Ceilidh 90 (4.7%) has shades of summer ale and a zesty, tropical fruit aroma which carries through to the taste and is likely to appeal to cask drinkers and lager lovers alike. It’s a balanced brew combining sweetness and gentle, dry hoppy bitterness and with clean, refreshing aftertaste. Available in keg and bottle. Staying with Scottish breweries Harviestoun Schiehallion (4.8%). The first time I had this lager was in cask (yes, cask) in the local Wetherspoon’s. It’s got some flavour characteristics in common with the Williams Bros lager with pineapple coming through in flavour and aroma, and some citrus elements too, followed up with an enticing dry finish. Schiehallion has already made it on to the menu at posh restaurants in The Shard (big, pointy glass building recently opened in that London) which is quite an achievement – next stop everywhere else please. Available in cask, keg and bottle. A theme is developing here as my next tip is also from Scotland. WESTSt Mungo (4.9%) – from Glasgow – is brewed according to the Bavarian beer purity law – the Reinheitsgebot. It decreed that beer may only be made with water, malt and hops and NOTHING else (yes, curiously no mention of yeast). Whether you think this is a bit of a gimmick or not the facts of the matter are this is one hell of a tasty beer. An appealing aroma that is partly grassy and also somewhat floral (think gorse on a hot summer day) draws you into a dry, crisp brew with a subtle sweetness, a clean finish and a gentle bitterness that comes through in the aftertaste. Look out for it on the shelves of Waitrose. Available in bottle and keg. Heading back to England – and specifically London – there are a number of breweries with lagers worth getting your laughing gear around but I’ve narrowed it down to two. 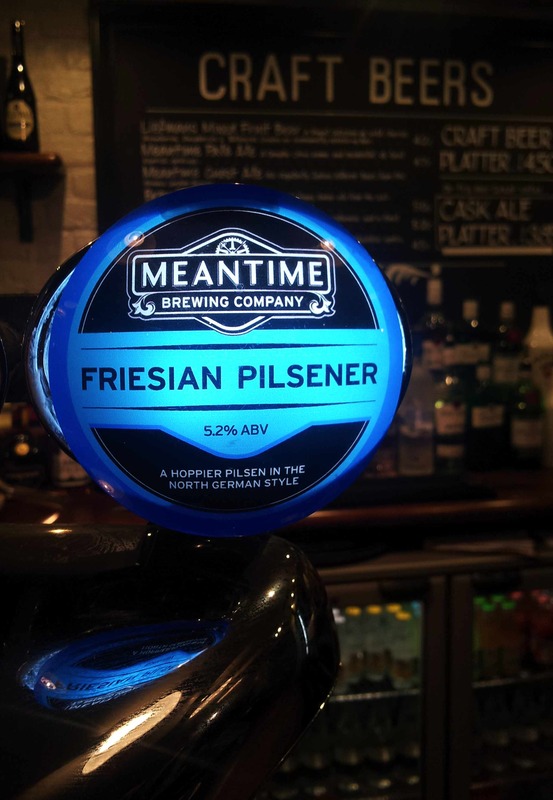 Meantime have been making their classic London Lager ( 4.5%) for several years and it’s well worth a try if you don’t know it. Look out also for their seasonal brews which include their somewhat limited edition Friesian Pilsener (5.2%). This glowing lemony-gold brew is a smooth and not too gassy fruity lager with a lingering, clean and cerealy aftertaste in which the beer’s fruitiness persists long after each mouthful. In the west of the capital Fullers – who have been touting their Honeydew organic beer to try and entice lager drinkers for some time – have branched out even further than their usual adventurous ways to make Frontier (4.5%) which is another fruity brew with a melon and lychee character but without the zestiness that you often find with such flavours (in US IPA for example). Fullers obviously has a sizeable estate of pubs mostly in London so there’s a decent opportunity for them to offer this lager more widely. It will also be interesting to see what their new venture (which I understand is a craft beer bar) in Putney holds in store and how it sits with well-established award-winning Putney pub The Bricklayer’s Arms where you can already find plenty of wonderful beers in cask and keg. Another new kid on the lager block is Hogs Back. They’ve been brewing ales like their well known TEA for more than two decades but have now added a lager to their portfolio. 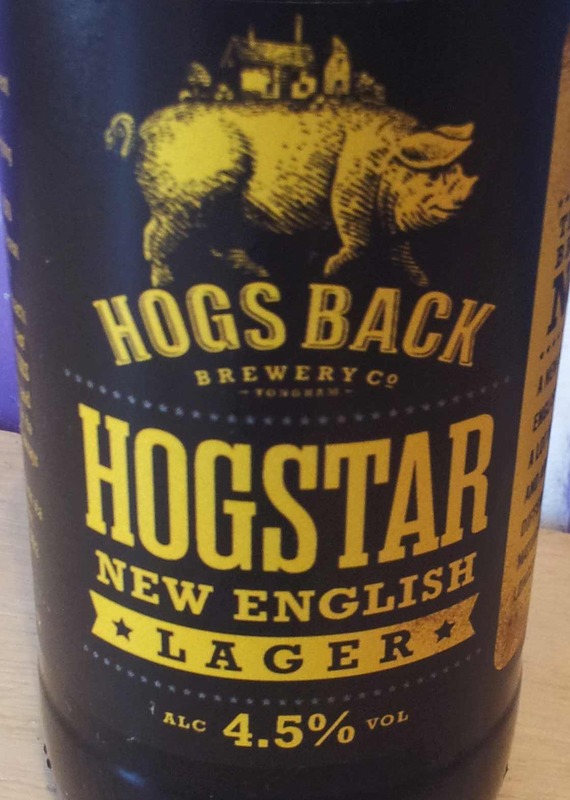 Given that Hogstar New English Lager (4.5%) has been released under the banner ‘Trial Brew No. 1’ it might be just a toe in the water – and perhaps the recipe needs perfecting before that little digit makes it to market – but it still packs a hell of a lot more flavour than a pint of mass market bland and cuts a dash with its rich autumnal gold colour. 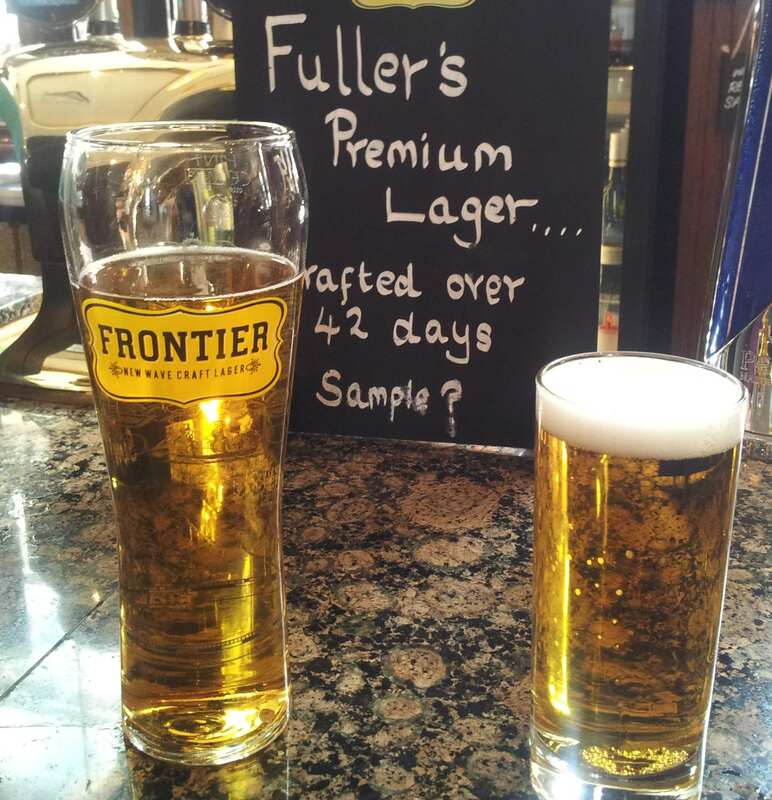 Taste wise it is in the same bracket as the Fuller’s Frontier and the Friesian Pilsner – fairly fruity with a cerealy finish. Head east from the hog’s back into the Garden of Kent and you’ll find a vineyard that also makes beer – and a lager as one of its flagship brews. Chapel Down Curious Brew (4.7%) is re-fermented with champagne yeast as well as featuring Saaz, Cascade and Nelson Sauvin hops. It is a posh lager with a peaches and cream aroma, a subtly fruity flavour but a lot of a body. Look out for it in bottle and on draft/keg. Finally, heading west once more, look out for St Austell Korev (4.8%) which has a honey-drizzled tropical fruit flavour with a pleasing tongue tingle and a dry after bite. Available in bottle and keg – and usually offered in an attractive stemmed glass when on draft. Although challenged by the popularity of cider, lager still accounts for a good percentage of sales in pubs so isn’t it high time quality British lagers were given more space on the bar? Calvors from Suffolk brews FOUR different lagers! I forgot to mention Suffolk’s Calvors which brews a range of four different lagers including two darker ones – another style that deserves to be more popular. Their Amber (4%) is brassy-copper coloured with pronounced biscuit-like flavours and chocolatey elements while their Dark (4.5%) is more continental in style, with lovely banana and clove aromas (like a German wheat beer), a malted dried fruit flavour but still the refreshing quality you’d expect from a lager. Available from their own pub, The Rampant Horse in Needham Market, and in keg/bottle elsewhere too. Disclaimer… this is not an exhaustive list. Calvors has been added because omitting them was an oversight! Are there any British lagers? Not a massive fan of lager but am always open to trying more as that’s probably fed from the lack of decent predecessors. I tried a really nice one though at LCBF by Crate Brewing, just called “Lager” as I recall, very flavoursome though. I’ve also drank absolutely loads of Camden USA Helles this year, it’s been our go to refresher in hot days now its more readily available. Cheers Phil. It’s funny that so many of us beer fans say we don’t like or don’t drink lager. I was in that camp for a long time but when the weather is hot it IS nice to have a cold beer and lager can cope with being served cooler. I will admit to not being a huge fan of Camden beers but I also found their USA Helles v.tasty! I remember years ago Iceni brewed a Lad’s Lager and marketed it at the same crowd as were drinking Carling, Stella and Kronenburg back then. It was moderately popular, but didn’t really take off. Was a good lager, but I think it was just ahead of its time, and probably had too much flavour for the drinkers it was aimed at. Yes. Although I’d love to think that the Brit lagers I’ve suggested here could see off the mass market brews they do have a LOT more flavour than those brews and perhaps might not appeal to drinkers who prefer… shall we say… less flavour! 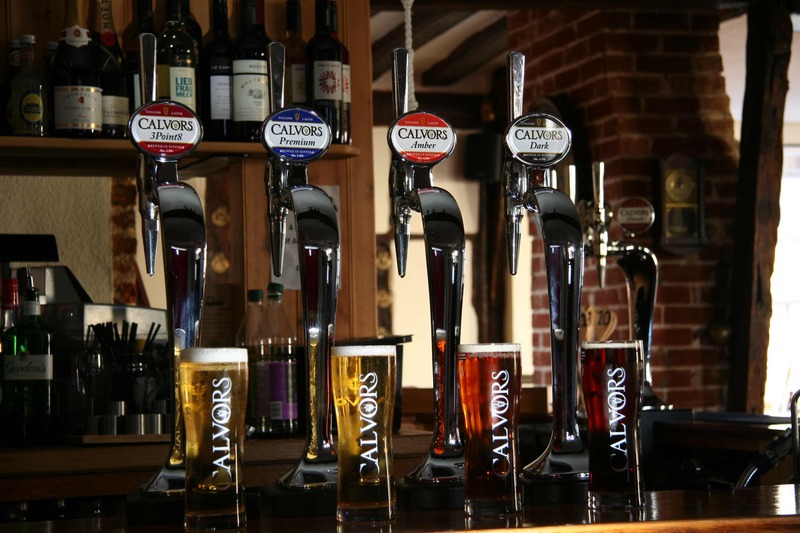 Here at the King’s Arms in Upnor , Kent , we sell a number of craft brews , including Calvors 3 point 8 . Also on our bar is a lovely premium lager from St Peter’s in Suffolk. At 5.2 % it’s a true premium brew , not so gassy , and full of flavour. It’s like lager for beer drinkers !